Those who invest in Belize real estate and businesses keep an eye on popular “Best Of” lists that often highlight the beautiful country and display its wonders for the world to see. We’re proud to point out that Ambergris Caye, the most popular island in Belize, has once again put Belize at the top of a prestigious and competitive list. It recently won Trip Advisor’s 2014 Traveler’s Choice Award for Best Island in the World for the second year in a row. With its turquoise, Caribbean waters and stunning views, there is no doubt visitors will find the caye to be a beautiful place to get away from the stresses of everyday life, to relax and refresh yourself, and to witness the spectacle of some very interesting antiquity. Whether you are interested in fishing, sky diving (which is particularly popular during the winter months), snorkeling and deep sea diving, walking around San Pedro Town—the only town on the caye—or simply lounging, there is something for everyone on Ambergris Caye. The caye is especially known for its Belize Barrier Reef, one of the largest barrier reefs in the world – second only to Australia’s Great Barrier Reef – and for its pristine, white sandy beaches. There are also a number of resorts and hotels on Ambergris Caye, some of which may be available for investment right here at Belize Shores Realty. A community of Maya lived on Ambergris Caye in Pre-Columbian times, and they made highly polished red ceramics, some of which can still be found on the island. The Mayan civilization’s presence in Belize is of particular interest to historians, both professional and amateur, and there are relics to be seen here that will fascinate the most ardent enthusiast. Ambergris Caye has a lot to offer, and if you can imagine watching a breathtaking sunset over the Caribbean while sipping a glass of wine, you can imagine the special beauty of Ambergris Caye. The people are always friendly and welcoming, there is always something close by to delight your senses. For more information on Belize and opportunities to invest in the wildly popular tourist destination, visit Belize Shores Realty today. For those who have invested in Belize real estate and businesses, the little country is one of the best-kept secrets of the world. Upon returning to the U.S. mainland, it can be amazing to hear the impressions that some folks have of Belize. So to clear up some of the common misconceptions, here are a few things that many people are wrong about. 1. You’ll have to learn Spanish. Many people believe that, even though Belize is an officially English speaking country, they’ll need to learn Spanish in order to get along with the native population. This is actually the opposite of the truth. In fact, Belizean children are typically taught English in school. Spanish speakers coming from neighboring countries usually end up learning English to fit in rather than the other way around. 2. Belize is a Caribbean island. Take a look at a map! When you mention Belize to friends who have never been to the region, many will undoubtedly state the belief that it’s located in the Caribbean. Of course, anyone remotely familiar with the geography of Belize knows that it’s a part of the Central American mainland. There are, however, a great deal of Belizean islands off the coast of the country. 3. Belize has bad infrastructure. Many people somehow have the impression that living in Belize is like returning to the Stone Age. This is absolutely not true. While there are occasional power outages, authorities usually fix problems very quickly. The power grid is laid out the same way as the United States, so you won’t need to bring adaptors for all of your devices. Even though internet is a bit overpriced, it’s quite reliable, and cellular phone service is solid and improving as well. 4. It’s always scorching hot in Belize. For those who don’t handle the extreme heat well, moving so far south can sound like a nightmare. And while others might actually be disappointed to hear this, the weather is actually cooler than you might think. Average temperatures range from about 75 degrees to 80 degrees Fahrenheit throughout the year. It even drops into the 60s on winter nights, but not so much that you’ll ever be nearly as cold as you were back home. The only way to get a 100% accurate impression of what Belize is actually like is to visit. Now is the perfect time to explore investment opportunities in Belize at Belize Shores Realty today. The year 2013 started out on an all-time high for Belize’s tourism industry, having documented record numbers for the first quarter. The trends in the first quarter of 2013 tourist arrivals are indicative of 2012’s patterns, in which substantial numbers were recorded per month. In fact, the last time there was a decrease in any month for tourist arrivals was October 2011- making it nineteen consecutive months of increases in overnight tourist arrivals to Belize. There was a record high in arrivals by air in January, February and March of 2013, showing a 7.58%, 6.0% and 10.1% increases respectively, compared to 2012. This year’s month of March recorded 28,623 tourist arrivals, which is over 5,200 more than last year’s March total of 25,982. This is the first time in history that arrivals by air exceeded the 28,000 visitor mark for any month. 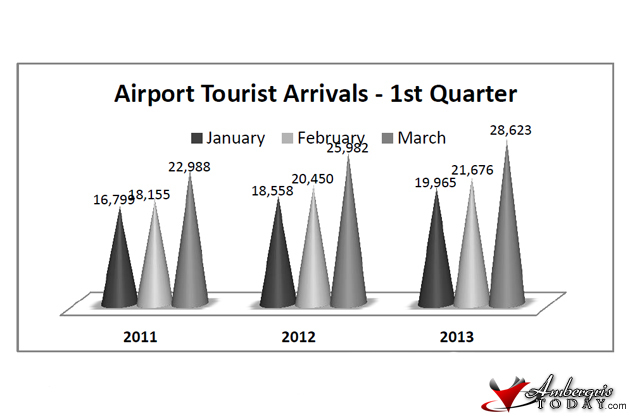 In summary, airport tourist arrivals showed 8.1% growth in this year’s first quarter, in comparison to last year’s. For overnight tourist arrivals, the months of January, February and March recorded increases of 17.2%, 11.6% and 11% respectively. For the first time ever, overnight visitors exceeded 35,000 visitors in March 2013. The previous all-time high was 32,240 visitors in March of the previous year. 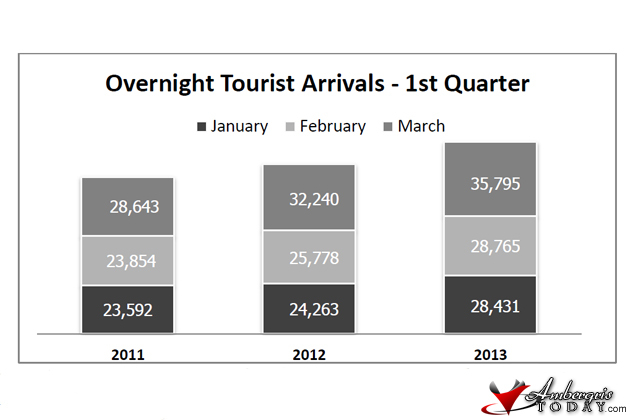 Overall, the overnight tourist arrivals stats indicate that there was a 13% growth over 2012’s first quarter. 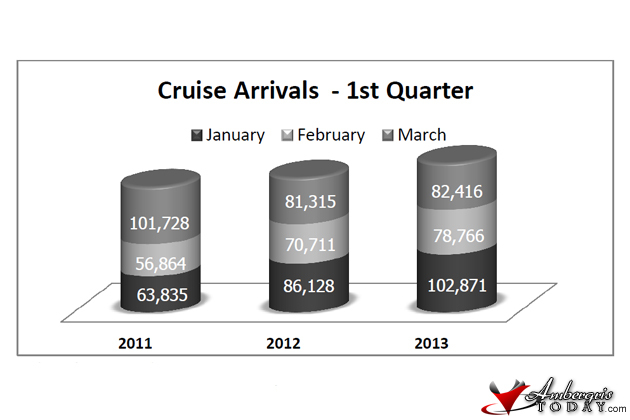 Despite dismal cruise arrivals last year, 2013’s first quarter showed notable increases. There was a 19.4% increase in arrivals in January, and an 11.4% increase in arrivals in February, compared to last year’s stats. In addition, March saw a modest increase of 1.4% over the previous year, all of which resulted in a total of 10.9% increase in cruise arrivals in the first three months of this year. For more information, please contact the Belize Tourism Board at 227-2420. This is nothing short of astounding and lends even more credibility to Belize being a primary commercial investment location. Contact us about all the wonderful properties and businesses that are available today. My wife and I are children of the 50s and 60s. We grew up in an America that was proud and living there made you feel like you were in the best place in the world at the best time in history. Then something happened in the early 70s. Whether I just matured and started realizing that the current events during our childhood was a stage show playing out to a devastating and surprising end, or whether there was some single event that was to change the future, I’m really not sure, BUT I do know that the America that we grew up in is not the same. My first jobs were with companies like Collins Radio/Rockwell, Fisher Controls/Monsanto, John Deere Tractor and on. I saw people no longer willing to stay loyal to any one employer because the employers were losing interest in taking care of their employees as they had since the industrial revolution and unionization. All of a sudden I felt an urgency to take care of my family in a more personal or self-sustaining manner and started moving around the country. While doing so we ended up in California where life became more isolated, even though the suburban populace seemed never ending. We went from our isolated homes, to our isolated cars, to our work cubicle, and back home, hardly seeing any neighbors except to wave on bar-b-q weekends! I longed for a better life even though my financial life was just fine, I didn’t feel at home. Many years later, after our two children had gone on their own, I discovered Central America. Life was back to the 50s and 60s again. Your neighbor was just that, neighborly. People waived on the streets EVERY MORNING! Hellos or Buenos Dias came from nearly every mouth you met. I was back home again! Belize is an oasis in Central America for most of us Expats from the US that refused to learn a foreign language. Come and visit San Pedro just once and 90% of you will be hooked! You may not have the same desire to leave the rat race behind as I did, but you will relax. Your blood pressure will settle, your nerves will calm, and your smile to neighbors and strangers will return. We investigated Panama, Costa Rica, Guatemala, and Belize. We felt comfortable here! Whether it barefooting it around San Pedro on Ambergris Caye, or rubbing elbows with the Garifuna in Hopkins. I don’t think you will find a friendlier place on earth. Now Tripadvisor has named Ambergris Caye the #1 Island in the World! What a statement! We agree! For any of you considering investing in a hospitality or tourism related business this year the Belize Tourism Board announced Great Results for 2012. It is EXTREMELY important to note that while the worldwide average tourism increase for 2012 over 2011 was 2.7%, BELIZE EXPERIENCED ALMOST AN 11% increase!!!!!!!!!!!!!! That is something to stand up and take notice about. Belize is becoming a HOT ITEM! From eco vacations, to scuba/snorkel vacations, to zip lining, to getting hitched, Belize is becoming the place to go! Cruise tourism did decline for the year but it was because Belize just doesn’t have the facilities yet to accommodate all the people and cruise lines that want to be here. Soon a cruise port will be developed that will accommodate them and these numbers will be on the increase also. Now is the time to invest in tourism in Belize. If you want to own your own mom and pop boutique resort, a multimillion dollar 5 star resort or restaurant, or invest in an existing business, the time has never been better to get in on upcoming profits. Contact us today by email or call 832-301-0540, 713-893-8023 in the US, or +501-625-6551 in Belize. Important news about the future of Belize Investment! In Belize yesterday afternoon some important news about the future of Belize Investment was announced. Prime Minister Dean Barrow announced that after his personal intervention with one of the co-chairs of the credit committee, Mr. A.J. Mediratta an agreement has been made that will enable the Sovereign nation of Belize to restructure its “Superbond”, the major external debt that Belize owes. Speaking at a press conference in Belize City yesterday afternoon, the Honorable Mr. Barrow said that “Belize had reached agreement in principle with its bondholders over the restructuring of the Superbond. This agreement is comprehensive, it is sustainable, and it will provide well in excess of $150 million in relief to Belize. According to the Prime Minister a term sheet is being prepared containing the particulars of what he and Mr. Mediratta have agreed. “Until that term sheet is prepared and signed off on I am not at liberty to tell you the details that we have agreed”. Evidently Mr. Barrow has been meeting with with Mr. Mediratta for several weeks in confidential and concurrent negotiations alongside the formal negotiations that the Belize SuperBond team and its U.S. based financial and legal advisers were holding. The PM refused to answer questions from reporters about any details stating that until the actual term sheet is produced and agreed to, which was estimated to be about the 15 of January 2013, he could not discuss the particulars. He also stated that “We certainly expect that the maturity of the new bond will be longer than what currently remains in the SuperBond, we expect that there will be a principal reduction, and we expect that in all the circumstances there will be a launch of the new offer with the new terms in or around the 15th of January 2013. We expect to close the deal in terms of having the creditors take up the new offer in time for us to start the servicing of the new instrument just at a point where the coupon for the old payment would have been due on February 15th 2013”. The Prime Minister announced that the solution to Belize’s external debt problems means that no new taxes will be introduced in Belize’s 2013 government budget. But he said that the government will have to find ways of introducing discipline in his government’s spending, something that the world would love to hear come out of other countries of the world. “There is going to be a rearrangement in terms of coupons and lower interest payments spread out over a far longer period. This is a huge victory for this country and makes a wonderful Christmas gift for the people of Belize,” he concluded. This means a more inviting atmosphere for Commercial Investment in Belize! However, Galvin also maintained that Belize can be much more than just a preeminent vacation destination. In addition to the beautiful sea and beaches, Galvin also considers Belize to be “heaving with opportunity.” Belize is still in its development stage, and thanks to a smaller population, there is plenty of prime space available to establish a business or create a new life. Galvin adds that Belize’s main language is English, and visitors are always pleasantly surprised by how friendly the local communities are. The world is full of new opportunities. However, if you are looking for an exciting new adventure, where you can build your life or business from the ground up, wouldn’t you want to do in a real-life paradise? Scuba diving, fishing and relaxing on a boat has to sound like an enticing way to spend your days off.